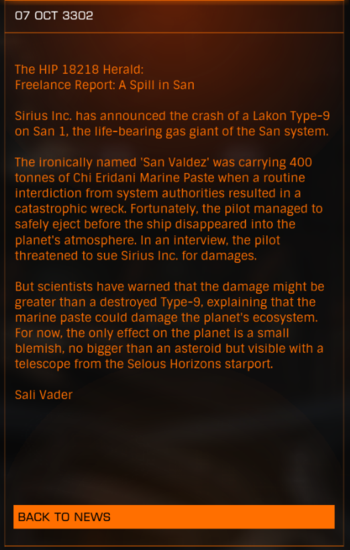 Sirius Inc. has announced the crash of a Lakon Type-9 on San 1, the life-bearing gas giant of the San system. The ironically named 'San Valdez' was carrying 400 tons of Chi Eridani Marine Paste when a routine interdiction from system authorities resulted in a catastrophic wreck. Fortunately, the pilot managed to safely eject before the ship disappeared into the planet's atmosphere. In an interview, the pilot threatened to sue Sirius Inc. for damages. But scientists have warned that the damage may be greater than a destroyed Type-9, explaining that the marine paste could damage the planet's ecosystem. For now, the only effect on the planet is a small blemish, no bigger than an asteroid but still visible with a telescope from Selous Horizons starport.